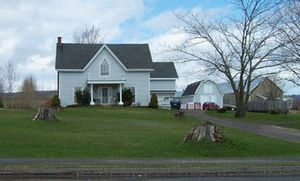 On April 29, 2005 Roger Hétu, Ken Bellfountain, and Susan Surette-Draper, members of the "Comité de la Cloche" of Les Amis de Grand-Pré, drove to Canning and found themselves immersed in the 1700's. Their tour guide for the afternoon was Lewis Hazel, a 70 something, retired backhoe operator who had spent 51 years excavating and more years than that, listening to his treasure-hunter father's tales.We considered ourselves lucky to find such a knowledgeable source and as he told us, he is one of the last people left in the area who can remember and locate the sites he would lead us to. In preparation for our visit, Lewis had prepared a route, which would allow us to follow the story and make interesting observations. 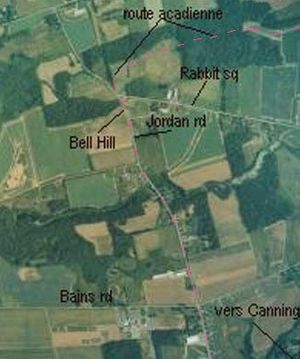 At the foot of the J Jordan Rd, Lewis pointed out the homes that have recently been built on the land where formerly there had been an Acadian cemetery. Children used to pick clover there. The old railroad bed snakes behind the houses and is still visible today. When it was constructed, the railroad went right through the cemetery. We were told that it is thought that the Acadians buried their dead in the dyked lands, which permitted them to use it in the winter, as there would have been no frost in the soil. Lewis pointed out the newly renovated house across the street that previous owners had identified as the place where a 10x16 ft parsonage had once been. They tried to preserve its foundation by building around it. Subsequent owners and the passage of time make it questionable if the present inhabitants are aware of their location's previous vocation. Would they be interested in knowing that a priest once had a modest living space and a small sanctuary there? Lucille Amirault of Le Comité du Cimetière Sainte-Famille has told us that similar situations existed in the Falmouth area during Acadian times. Driving along the winding, narrow Habitant River, we were told that the Mi'kmaq had spent time there because of the artifacts and implements that were unearthed along its banks over the years. Our second stop was at the Habitant Cemetery, which dates back to the 1770's but our attention was drawn to what looked like the farm road alongside. This road was known as the Old French Road and started at a wharf on the riverside. Lewis told us of a ramp for off-loading of Acadian boats with provisions for the long ago inhabitants. We know that the Acadians were well known for their coastal navigation ships that could maneuver where larger ships could not. On a windy day like today, it would be a challenge for even the most skilled of captains. As we continued up the Pereau Branch Road, Lewis informed us that we were actually driving on the "Old French Road". This is the same one that was laid out in the late 1600's/early 1700's. It seemed so logical, it is just straight up from the wharf! We turned R at the Blomidon Rd and then L at the Pereau Community Hall and Lewis pointed out how the Acadians built their roads by following the natural lay of the land. Instead of going straight up and across the rolling hills, they built their road at thebase of the hills and just followed the natural crests of the land. This also seemed perfectly logical to us who know that this was the practice of the Acadians when they built their dykes. They built smaller and shorter dykes than today's and usually followed along the side of rivers and streams as opposed to the more difficult mouths of rivers. "Keep things easy and uncomplicated and go with the flow" might have been their motto. At a stop sign and a big shoe, we were facing the property at which, it has been said, a church once stood. Sometimes it is hard to imagine something and this was one of those times. A dug out hill and farm equipment was what we could see. 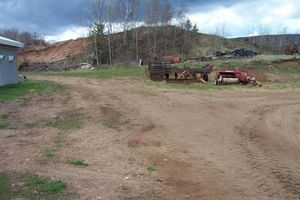 As the story goes, a man with a name that sounds like Bill Lousin/Losier/Lussier had identified this site and brought Lewis's father there many times. We continued to drive and Lewis called our attention to the fact that the "Old French Road", which he could trace, ran past the side of the church, along the base of many hills and came out at Bell Hill. Arriving at Bell Hill, we were shown where the bell was found. This coincides with the yellow line of the road and the power poles on the down slope of the road. Why would anybody bury a bell in the middle of the road? Well, the road was much narrower then and it would have been buried "beside" a much narrower road. Interestingly, the famous Sir Frederick Borden's family owned the farm nearby. A famous hill, indeed. The bell is gone. 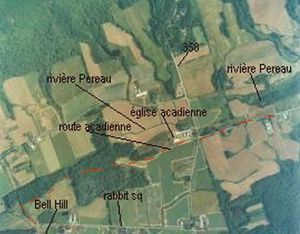 Ed Coleman tells us in his article of Friday April 29, 2005 that it was discovered by men working on the road and that "an Acadian bell is said to have been discovered about 75 years ago, a few miles north or north-west of Canning in an area quaintly known as Rabbit Square." Here we are! Could it be that this is called Bell Hill because of its shape, as is suggested by Leon Barron, a local history collector? Buried bells with or without the accompanying gold have been found and documented in Port Royal, PEI, Upper Sackville, Maine and Cape Breton so why not Bell Hill? 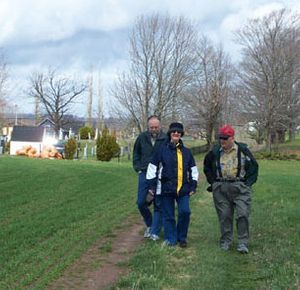 After following the winding path of the "Old French Road", we may be ready to believe the Acadian bell story but why was the church so far from the cemetery and the river? Were there two churches? One for the first settlers and another for the new families that established themselves here as the community developed? Why was it so far inland? If the folklore is right, this bell should be found in Montreal in a museum somewhere. We will have to continue our search. As we drove to Woodside and turned at the yellow farm buildings of the Ells farm and passed the newest valley crop of grapes sprouting new shoots, we once again saw the "church" location but now, in this perspective, nestled at the base of a ridge of hills, it was easy to imagine. Discussing the location and surveying the surroundings, Lewis gave us another nugget of information. The landscape has changed here since the time of the Acadians. 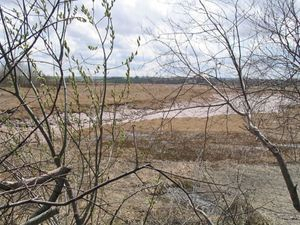 The Pereau dyke has restricted the flow of water so that what was once a river at high tide and a riverbed at low tide is now a fertile field. We can see that the church site sits on higher ground and that parishioners from Pereau could have come to church by boat! Now it doesn't seem so remote and inaccessible. Lewis has one more surprise. In his years of excavating, he has come across some ingenious Acadian inventions like the brilliantly laid out drain tiles in the Belle Isle dykelands not far from Port Royal. He was able to show us where the Acadians had built a "stone bridge" in order to traverse the river. Here is how it worked. 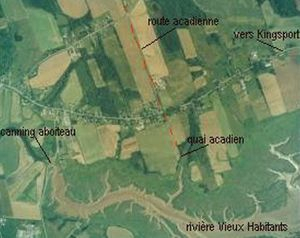 The Acadians would construct a "bridge" of rocks by laying them and piling them to form a road, on the muddy riverbed. This was supported by posts and provided a hard surface for passage. These bridges were totally submerged when it was high tide and because the water could go right over the rocks. The bridges were located in a narrow and shallow spot in the river, when the tide receded, it was still intact and passable again! Sometimes, all you need is a little information and what you see before you, takes on a new meaning. It will be impossible to drive the country roads of Canning without thinking of the many families who lived, worked, worshiped, farmed, traded and buried their valuables as they fled 250 years ago this year. Were they thinking that this was just the latest in the series of raids or crisis that was common for new settlers and that they would return as they had before? How could they know that, as they buried their valuables in shallow, hastily dug holes that they were leaving for good? 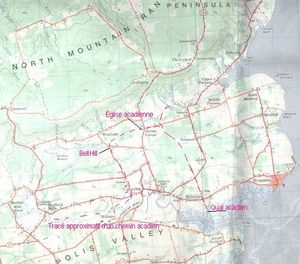 In the Annapolis Valley of today, legends have survived of grandsons who came, years after, with tattered hand drawn maps, only to find a changed landscape and a sad closure for this part of their family history. Today, we were able to see their village in our imaginations.